What are the benefits of a storage server? What can I store on a Storage Server? How do I connect to a Storage Server? What type of storage servers are there? If you have multiple PCs with increasingly large amounts of digital media then protecting that data is made simple with a home storage server. A Storage Server (also known as a Network Attached Storage – NAS), put simply, is a piece of equipment that sits on your home network that gives you the ability to store and share data with other members of the household. The growth of digital cameras and mp3 players, like the iPod, has resulted in very large amounts of irreplaceable data that is not currently backed up. A simple mishap with your laptop could end up in tears. 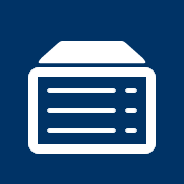 We can supply and fit a Storage Server to meet your needs. From a simple network drive to a fully protected and redundant Storage Server. Speak to us today for free advice on the best solutions for you. How much does a Storage Server cost? The cost of the Storage Server you choose is based on the type of Storage Server (NAS) you require. We supply and fit a range of Storage Servers from off-the-shelf units that costs range from £99.00 to custom built units well in the thousands but there are many mid-range devices that offer excellent value for money. Call us today for free advice on the best solutions for you. Sharing Files – you can share files between computers without the need for removable storage such as USB memory sticks. You can easily share photos, music, movies and documents. Backups – this is one of the tasks most critically overlooked in home computing. A network storage server takes advantage of your home network to backup and store the personal and shared data for everyone in the home. Capacity – a storage servers provide much greater capacities than the built-in or external storage on your laptop or PC. A 4Tb storage server holds 25 times more data than a 160Gb drive typically found in a laptop. Data Protection – mid to high end storage servers have multiple drives inside so if one of the drives fails the other drives compensate to prevent data loss. The failed drive is then simply replaced and the system rebuilds itself. And you can still use the server while all this happens. Remote Access – A storage server can be configured to access from the internet. So you can even access your data away from home. 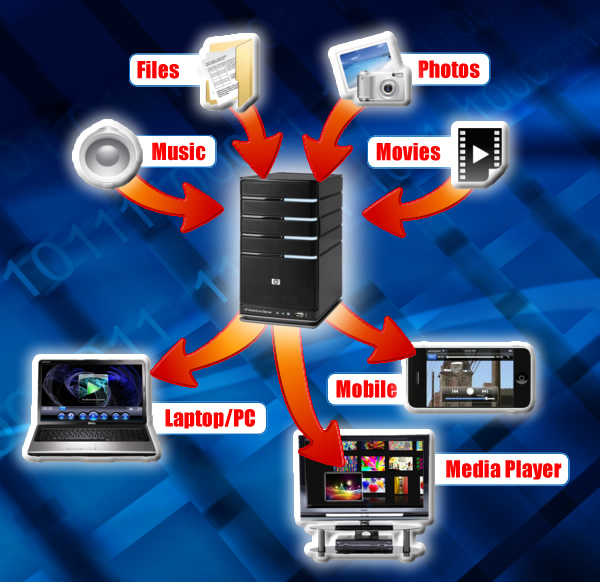 You can store any type digital media on a storage server, including music, videos, pictures and documents. These can then be accessed by any other device on the network. And if you have a broadband internet connection you can even access your data away from home. And depending on the model, these capacities can be expanded very easily. 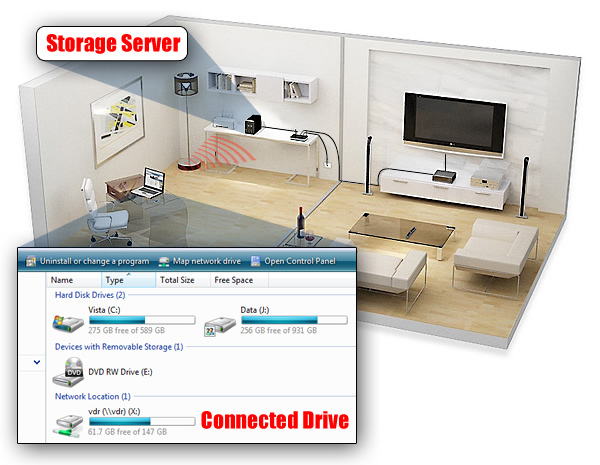 A Storage Server connects to your home network as an additional hard drive and is displayed on your computer as a network drive. Each directory can be protected and accessed based on your security requirements. So every member of the household can have a personal area or you can share the drive for everyone. Mirrored Drives (Raid 1) – two disks in a network enclosure. When you save a file to the Storage Server, a copy is put onto the second mirrored drive. If one drive fails you still have a copy. Multiple Drives (Raid 5) – three of more drives joined to form one bigger drive. One of the disks acts as a spare so if any of the drives fails that data is not lost. Multiple Drives with Hot Swap (Raid 5) – This is exactly the same as above but with the added ability to remove the failed drive without the need to take the Storage Server apart or shut it down. Which ever option you choose, we can build, configure and install the perfect device for your needs.